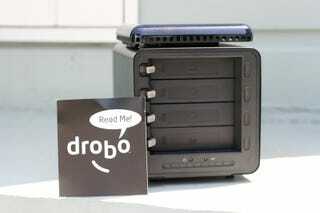 We told you guys about Data Robotics Drobo storage robot a few months back. The little hard drive enclosure that will hold up to four 3.5" drives. Well we've been trying out our very own demo unit for the last week or so. What do we think? It's expensive, for starters, and the port list leaves something to be desired. First things first, what didn't we like? Ok, so it's either one of those guys or the Drobo. But if money's no object or you really like hard drive space then that won't be a problem. But if you're like us, we personally would have to think long and hard about this purchase before we dropped that much cash on an empty hard drive enclosure. Drobo is USB 2 only. While many people claim that USB 2 is plenty fast enough, if you're plunking down a couple hundred dollars you'd expect at least USB2, Firewire 400 & 800 or even an Ethernet port. The good news is that Data Robotics confirmed that they are going to at least implement Firewire into future revisions. But for now it's a big ol' deduction. If you have four drives installed, waiting for all of them to spin up seems like an eternity. We can't tell you how many times we went to save a file and the computer seems to freeze, only to hear the familiar wrrring of four hard drives ramping up slowly, one after another. This gets very annoying at times. But, unless you want to have your drives constantly running it was unavoidable. One of the claims Data Robotics makes is that Drobo requires zero software for use. While this is technically true, Drobo is plug-and-play, and on a Mac it leads to an interesting problem. OS X lists Drobo as a 2TB drive no matter how much storage has been installed. To alleviate this problem they do include an application called the Drobo Dashboard that will tell you how much space you really have. However, it has been pretty spotty. Many times it couldn't even tell that there was a Drobo attached. Also, this could have easily been turned into a widget for Dashboard or a Sidebar gadget. 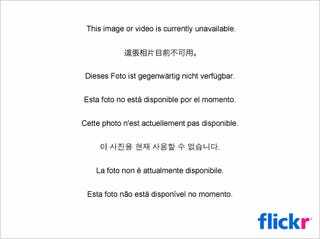 One thing we encountered was the unstableness of the Drobo. While it must be difficult attempting to maintain multiple drives of different speeds and capacities, this is what Drobo is supposed to do. However multiple times during our tests our computers would claim that our Drobo was unreadable and that the only options were to eject or reformat. This simply cannot happen to your storage on a regular basis. Which we found out the hard way, as our Drobo video review was wiped out. However, that's about as bad as it gets (although the last one was pretty bad). We know you're all dwelling on all of this right now, but the Drobo is actually a pretty amazing piece of hardware when it is running like it should be. Now on to what we love about it. No longer do you have to worry about a file that is 100GB when you only have 2 80GB drives. Drobo does a fantastic job of instantly mashing your drives together into one large virtual drive. No more keeping some files on one drive and others on another. Drobo moves all of the data around in small packets, so that it can be dispersed over all of your drives. Basically it acts like a RAID setup, but without all of the technical setup that's typically required. This is where Drobo shines, it makes installing a new drive as easy as popping in a tape into a VCR. Just take any 3.5-inch SATA hard drive and pop it in. you don't need any tools and it doesn't matter what speed or size each drive is. Just toss it in and let Drobo go to work, instantly you'll see your available storage space increase. We know none of us backup our data nearly as much as we should, or at all for that matter. But who can blame us when it's such a pain to have to keep on balancing external drives or install yet another internal drive. Drobo is the first backup solution that I've seen that might actually work (Aside from Time Machine), and that's because it does it without even asking. It is always making backups of your data. However this comes at a price with storage space. For instance if you installed 1TB worth of drives, you really are only getting 509.9 GB of pure storage before Drobo starts telling you to go out and look for a bigger drive to pop in. While it does take its toll on available space, how nice is it knowing that all your pictures, files, songs & movies are all safe for once. One of our computers is a Mac Mini that is covered in external drives- two 80GB drives, one 250GB drive, and one 300GB drive. That means there are four enclosures, four power bricks, and four fans spinning and they aren't even in a RAID array, so they're independent storage spaces. Drobo thankfully gets rid of all of that. You have one box, one power cord and one intelligent fan system that only runs when it gets warm. And when you live in a tiny apartment every inch counts, so getting rid of all those extra parts is quite a luxury. Compared to most hard drive enclosures the Drobo looks like a piece of art. With its simplistic black outfit and glossy magnetic cover, it definitely will grab your attention, while still being simplistic enough not to stand out too much. While the storage monitor lighting is well done, we do wish their was an option to turn it off since it's pretty damn bright (You can see it glowing all the way down the block) and you can get the same info from the Drobo Dashboard application. We suggest persuading your friends to pick one up so that the price drops faster. That way when you go and buy one after a revision or two, not only will some of the flaws be worked out (Stability/Ports), but it should be more reasonably priced as well. Because once they get the growing pains straightened out this will be a great storage solution. However given the current price and stability issues we say pass on the Drobo for now. Okay, reader, now that we've got that out of the way-what do you want to know about the Drobo? What questions are still lingering around that head of yours? Let us know and we'll post a follow up for you.